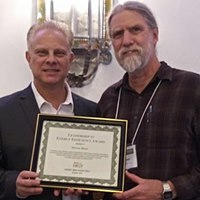 At its annual workshop last week in Santa Fe, N.M., the Southwest Energy Efficiency Project (SWEEP) presented its annual Leadership in Energy Efficiency Award to Steve Bean, Manager of Energy Efficiency Design at Public Service Company of New Mexico (PNM). Since Mr. Bean took the helm at PNM’s efficiency programs more than a decade ago, the company has helped customers save 620 million kilowatt-hours of electricity per year as of 2017, enough to power 90,000 homes. The programs, which launched in 2007, have cost about $186 million cumulatively, but have shown about $411 million in Present Value of Avoided Costs (including fuel and capacity cost), meaning large net economic benefits for households and businesses served by PNM. Moreover, PNM’s energy efficiency efforts avoided 2 million metric tons of greenhouse gas pollution, equal to the emissions of 428,000 vehicles for a year, while also saving New Mexico 913 million gallons of water. Howard Geller, SWEEP’s executive director, praised Mr. Bean’s leadership. “Steve Bean has done an admirable job leading PNM’s energy efficiency and demand response efforts. His leadership will be missed,” Geller said. Mr. Bean is retiring from PNM in the near future.